Aurum Alarms - Keeping your possessions and premises secure the right way. 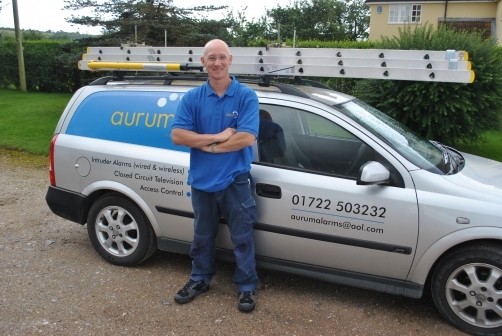 Aurum Alarms Limited is a local security company located in Salisbury, we provide all aspects of electronic security. We have secured a range of premises from installing domestic alarm systems to large commercial CCTV projects. We provide our services in many areas including Salisbury, Amesbury, Wilton, Downton and Andover, generally, but not limited to, a 35 mile radius of Salisbury. We support local community and charitable organisations including The River Bourne Community Farm and The Trussell Trust. Our engineers have years of experience installing and servicing an array of electronic security, in fact in excess of 100 variants of access control, alarm systems, CCTV installations. All our engineers are security screened, uniformed and take pride in providing a courteous and efficient service. We are always respectful of our customers, their homes, and their business environment. Much of our work originates from recommendations by our existing customers. We are proud to be a recommended alarm installer in the Salisbury area. Aurum Alarms are not tied to any particular equipment supplier, we provide the best solution at the most economical cost. We believe our aftersales care to be unrivalled. Upon completing an alarm installation we take the time to explain simply the operating procedures ensuring that you the customer is confident in its use. We provide free telephone support and will revisit without charge should you need a refresher on any points to ensure you get the full benefit of the installed security equipment. We want you to feel that your security system is a really beneficial asset, simple and effective to use bringing continued 'Peace of Mind'.